THE Rohingyas have often been called the most persecuted people in the world—with good reason. Most have lived in Rakhine state in western Myanmar for generations, yet have always been denied citizenship by the government. Indeed, they are not even recognised as one of the country’s 135 official ethnic groups. Over the decades these Muslim non-people, without legal or any other sort of protection, have been the victims of wanton discrimination and violence by both the virulently anti-Muslim Rakhines, a Buddhist ethnic group, and agents of the central government. One of the few things Rakhines and members of the ethnic Burmese majority have in common is a shared hatred of the “Bengalis”, a label they both apply to Rohingyas with contempt. Rohingyas may once have imagined that their plight could not get much worse. If so, they were wrong. After two bouts of vicious ethnic cleansing by Rakhine nationalists in 2012, about 140,000 of an estimated 1.1m Rohingyas fled into refugee camps. They have not been allowed to leave. 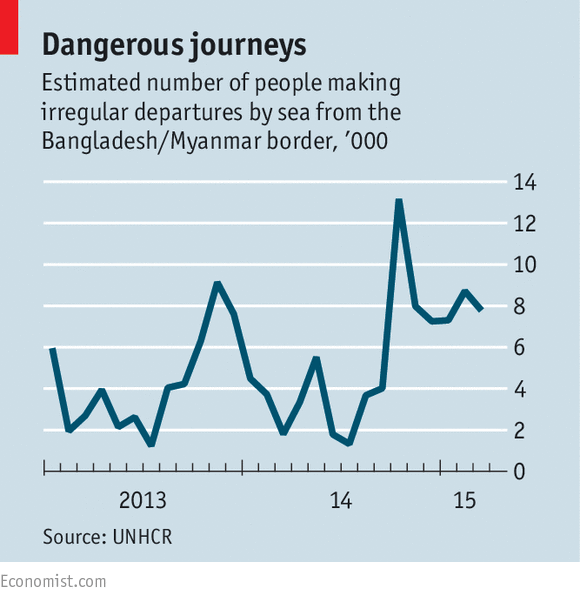 Growing numbers have been trying to escape by sea to Malaysia, Indonesia and Thailand (see Banyan). An unprecedented 25,000 of them, including Rohingyas from neighbouring Bangladesh, got on boats during the first quarter of this year, desperate to get out before the start of the tropical monsoon season renders travelling all but impossible. And unprecedented numbers are dying in the attempt: about 300 between January and March, and more since. Since 2012 all the Rohingya villages and camps have been totally cut off from predominantly Rakhine towns like Sittwe. This has made it almost impossible for inhabitants to make a decent living. Tall wire fences are now being erected, completing their isolation. One Rohingyan says he used to have a good taxi business in Sittwe. Now he uses his motorcycle to carry a few customers in a small village. He makes about one-third of the money he used to. Most Rohingyas are farmers or fishermen. The former cannot return to their fields; the latter have few boats left and are driven away from fishing grounds by Rakhines if they manage to get out to sea. The local authorities insist that this forced isolation is for the Rohingyas’ own good, to protect them from further attacks. Rohingyas, however, see it as the culmination of a long-standing policy of apartheid, depriving them of the last benefits that they enjoyed living among Rakhines. No Rohingya student, for instance, has been allowed into the university at Sittwe during the last three years. They are not allowed into the township hospitals unless it is a life-and-death situation. “It’s really inhumane stuff,” says an aid worker. Any hopes among Rohingyas that the country’s turn to quasi-civilian rule in 2011 after decades of military dictatorship might improve their lot have evaporated. While life is improving for many others in Myanmar, it is not for Rohingyas. They are unwitting victims of a deadly political game for control of what some Burmese proclaim to be the “New Myanmar”. Thus, for instance, while the rest of the country is preparing for a general election in November—the first democratic one in a quarter-century—a sleight of hand involving their voting documents has effectively deprived Rohingyas of the right to participate. Last year, during the first national census for years, Rohingyas were only allowed to register as “Bengalis”. In protest, most of them boycotted the count. The government is pandering to a growing anti-Muslim hysteria in the country. Such sentiment has been encouraged by hardliners in the army and the ruling party who calculate that humiliating the millions of Muslims in Myanmar plays well with many Buddhist Burmese. It is often supported by the more chauvinist Buddhist monks as well. The hardliners have an election to win; they believe that playing to anti-Muslim feeling might give them an advantage over the opposition leader Aung San Suu Kyi and her National League for Democracy party. Even Ms Suu Kyi, however, a Nobel peace-prize winner who campaigns relentlessly for human rights and the rule of law, has been loth to stand up for the human rights of Rohingyas. For some of her supporters, this has been extremely disappointing. Her low-key response has made it easier for the government virtually to ignore the boat-people crisis. By May 19th there had been no mention of it in the government-run Global New Light of Myanmar, an English-language newspaper. Rohingyas are not technically “citizens”, so the government feels that it can wash its hands of the problem. Clearly ministers feel that they have no wider moral or humanitarian obligation to people whose families have lived and worked here for, in many cases, over a century. In the face of such callous indifference from all quarters in Myanmar, it is hardly surprising that so many thousands are taking to the sea. Unless the situation changes, the only guarantee is that even more will try to flee at the start of the next dry season, with the same appalling results.